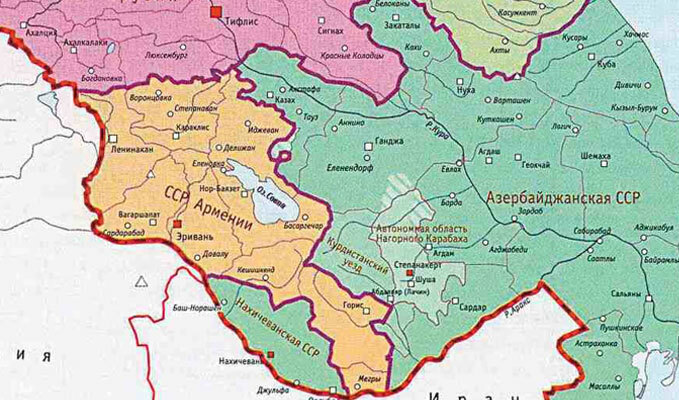 It’s a known fact that during the soviet era the territory of the Armenian republic included 3 Azerbaijani exclaves (enclaves for Armenia), while Armenia’s Artsvashen exclave (see the map) was situated in the soviet republic of Azerbaijan. It’s also known that at the beginning of the 1990s all of the four enclaves ceased to exist as a result of the Armenian-Azerbaijani conflict. 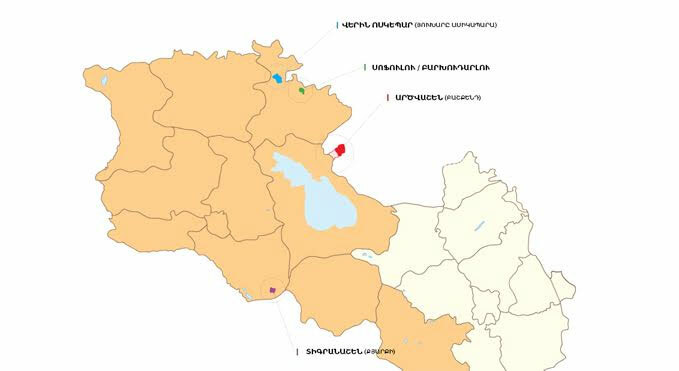 PanARMENIAN.Net - It’s noteworthy that even nowadays these territories can sometimes be seen on administrative maps. Not existing in reality, these administrative units arouse legal and political issues. The history of their creation and development is rather interesting. This article will explain how these territories appeared and what consequences their disappearance had for the sides. At the beginning of the Armenian-Azerbaijani conflict, precisely on January 15, 1990, Armenian detachments entered the Azerbaijani enclave Qyarqi situated in the Ararat province, not far from the border with Nakhijevan. Qyarqi village, through which the Yerevan-Meghri road had been built, was later renamed as Tigranashen. In July 1992, the Armenian forces seized a gun post located in the Azerbaijani enclave of Upper Askipara (or Aksipara), and allowed its population to flee to Azerbaijan through a corridor. During the same period, Armenians took control over Barkhudarly and Sofulu villages. On August 8, 1992, Artsvashen fell after five days of fierce fighting. The cause of this defeat has been a topic of hot debate up to date. Some say that the forces were unequal; some say that Armenia and Azerbaijan had just “exchanged” the enclaves. It’s hard to insist on the theory of possible “exchange”, however, it’s absolutely wrong to say that Armenia got three enclaves in exchange for one. The history of three Azerbaijani exclaves shows that these administrative units have been formed on the territory belonging both to the First Republic of Armenia and the Armenian Soviet Socialist Republic just in order to satisfy the territorial claims of soviet Azerbaijan. During of existence of the First Republic of Armenia, the border issues between Azerbaijan and Georgia remained unsettled, what became a burden for soviet Armenia in 1920-30s. Being a part of the Soviet Union, Azerbaijan continued claiming lands. Thus, the Ghazakh district of Elizavetpol province was divided between Dilijan province of soviet Armenia and Ghazakh district of soviet Azerbaijan, with the border issue still unresolved. The situation in Tavush was tense, with the continuing conflict between Armenia and Azerbaijan not only for control over the territory but also for the use of agricultural lands and forests. The Azerbaijani side strived to tear more territories from Armenia and usurp thousands of hectares of fields and forests. The border between the soviet republics of Armenia and Azerbaijan in1928. Artsvashen and Armenia have ground communication. In 1923-29, the Transcaucasian central executive committee formed a commission dealing with the territorial disputes and resolving them exclusively against Armenia. The so-called exchange of territories was carried out one-sidedly at the expense of Armenian lands, giving part of them to Azerbaijan. Thus, in January 1927, the territory of about 12 thousand hectares from Bashkend to Dilijan was ‘gifted’ to Azerbaijan’s Ghazakh district. 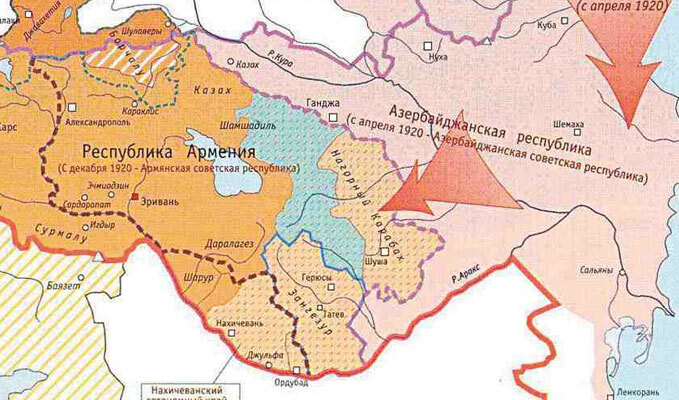 As ‘compensation’, in February 1929, under the central executve committee’s decision, Armenia got a connection with Bashkend through a strip of land, which was however, given to Azeris in 1930s, making Artsvashen Armenia’s exclave in Azerbaijan. The wedge-shaped Lower Askipara (the corrupted variant of Armenian name Voskepar) lying between Ijevan and Noyemberyan was also a part of the First Republic of Armenia. In 1920, this territory including the neighboring villages of Baghanis-Ayrum, Ghushchu-Ayrum, Mazam and Kheyrimly was transferred to Azerbaijan, which also wanted to get the area of Upper Askipara situated to the west of Armenia’s Voskepar village with a purpose to cut Armenia’s northeast regions and create favorable conditions for further predatory plans. It’s hard to determine the exact date of extinction of Sofulu, Barkhudarlu and Upper Askipara. The villages occupying a territory of about 3,300 hectares were recognized as part of soviet Armenia in 1929; however, in mid-1930s they were given to Azerbaijan for good and all. Apparently, Upper Askipara became an Azerbaijani exclave in 1933-34, while Sofulu and Barkhudarlu villages some time later, but before 1936. The borders of of the First Republic of Armenia. All Azerbaijani exclaves as part of Armenia. There is ground communication with Artsvashen. The exact date of Qyarqi enclave creation is not known either. 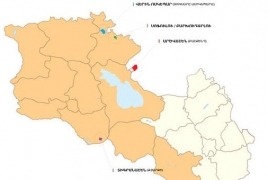 However, some sources as well as administrative maps testify that it was cut from Armenia and transferred under control of Nakhijevan in late 1940s. It’s also known that in December 1926, Azerbaijanis hampered the conduction of census in the soviet republic of Armenia, claiming possession of the village. It should also be noted that the decisions by the transcaucasian state bodies to tsransfer Armnian territories to Azerbaijan were made without taking into consideration the position of the Armenian authorities. Literature: “Territorial Losses of Soviet Armenia and Nagorno Karabakh Autonomous Oblast in 1920-30s”, authors Karen Khachatryan, Hamo Sukiasyan, Gegham Badalyan, Institute of History at RA Academy of Sciences, Yerevan 2015.